One of the most important trading lessons is: “Plan your trade, trade your plan”. 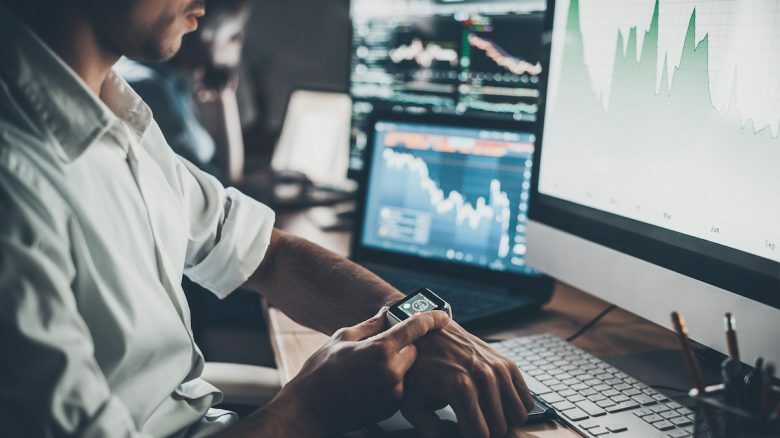 In this guide on planning and managing a trade we’re going to cover all of those vital steps that form the foundation of every trader’s career. From planning a trade, forming an opinion, working your winners and deciding on how to manage your risk. We’ll also touch on developing the right psychology as a trader – which will help you get over the pain. Successful trading is all about having a trading plan and a reason for every action. This removes the stress and the indecision which are both enemies of traders. They can paralyze the best traders at the worst of times. With that in mind, let’s get down to the business end of things and start looking at how to make a trading plan. 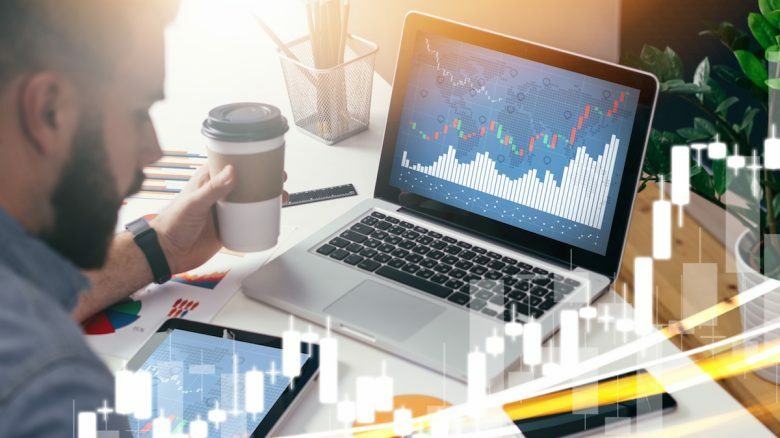 Technical analysis and charts give you a really quick and easy way to start forming a bullish or bearish opinion of the stock market, along with an individual stock, rather than going into the books and metrics of every single company. We’re going to start by checking out the S&P 500 index (Standard & Poor’s 500). This index basically is the thermometer of the US stock market. It gives you a very quick snapshot out the mood of investors. Let’s have a look at the longer timeframe. In the chart above you can see that we’re in a serious uptrend. The market has been very strong in particular since the 2016 election, but has been going on for about eight years prior as well. We’re in a very strong market, coming out of some choppiness last spring. We had the big rally in January, the sell off in February, the comeback and the S&P seems to be breaking out of it now. 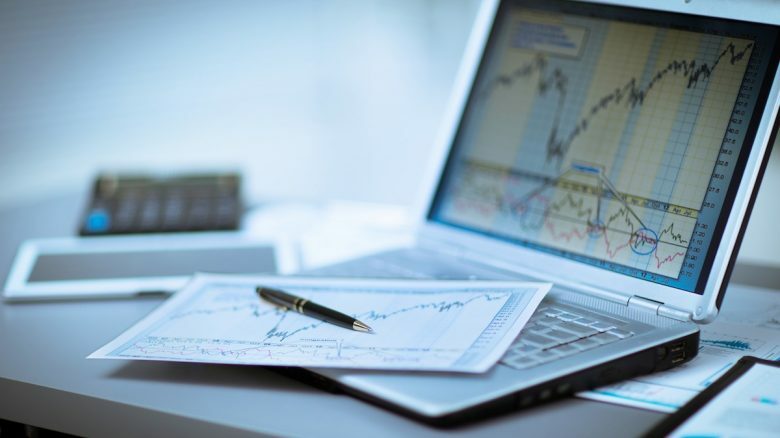 Before you start trading, you should use technical indicators to further visualize and verify your market opinion. For example, let’s check out the RSI (Relative Strength Index). The RSI is one of my favorite technical indicators to use. It’s a very quick snapshot about the momentum that is behind a stock and it’s very easy to read. When looking at the chart below, you can see the lines up and down below. The RSI indicator tells us that over 70 a stock is severely overbought. Below 30 a stock is very much oversold, which might be time to start considering getting in. You can see it was over 80 back in January, blasting the S&P up to new all-time highs. If you were considering getting involved there in the middle of January, the RSI at 80 might have been a red flag and might have told you to stay away. Likewise in February after the massive sell-off. 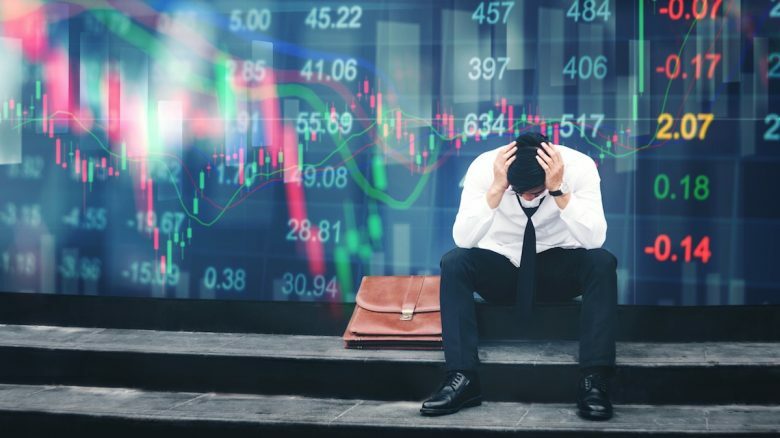 The RSI was down towards the 30s and some people might have been dipping their toes in on the basis that the market was just very oversold from a technical point of view. 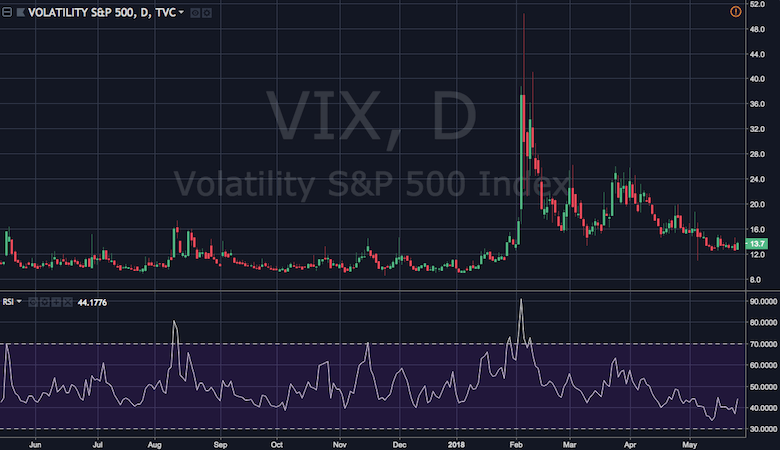 If you’re happy to start getting involved in stocks, it’s also worthwhile checking out the CBOE Volatility Index (VIX). The VIX is basically the market’s “fear index”. It’s negatively correlated with the S&P. Some questions you might want to ask yourself is if the VIX is very high compared to the historical average or is it very low. When looking at the VIX of the last couple of months, we can see that despite the massive spikes we had in February, it’s been coming off in the last month or so. Particularly the last two weeks it’s coming down towards new lows. In the end you tie in all these answers with the thoughts on your broader market as a whole and then you’re ready to start looking at specific stocks or other instruments to trade. If you’re ready to get involved in the markets, it’s time to consider how much capital to risk. The risk successful traders take varies, but a decent rule of thumb for beginners is the 1% rule. This basically takes into account whatever size your trading account is, you commit to not losing more than 1% of your account size in a single trade. 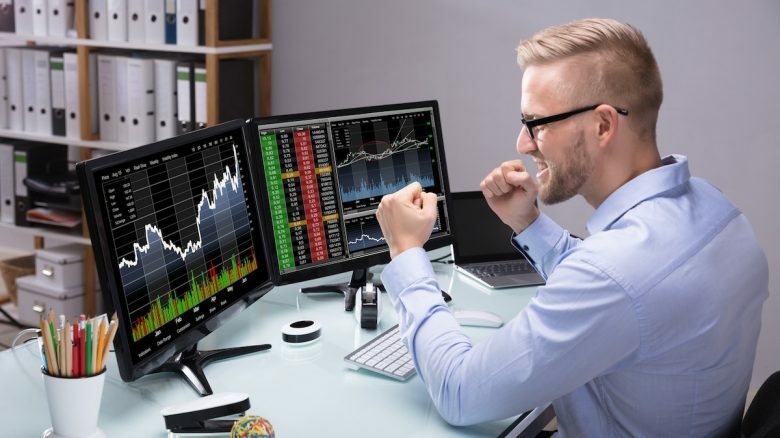 This can vary from trader to trader and account to account, especially for more experienced traders who have their own strategies. However, the 1% rule is a good first step in the right direction for a solid risk management. Say you have a $25,000 account. You’re committing to not losing more than $250 (1%) in a single trade. You just plan accordingly from there. You take a position that might be between 5-10% of the available capital. This example may be $2500 worth of stock. You’re committing to exiting your trade when your position is down 10% ($250 loss). The markets definitely are going to teach you lessons and you got to make sure that they’re as cheap as possible. Don’t be afraid of losers. A good risk management plan means knowing when to accept that you’re wrong. You should be able to get out of a trade, be able to recover and then move on because preserving your capital is the number one priority. This is particularly true when you’re just starting off as a trader. With more experience as a trader obviously comes more success and your percentage of winning trades will increase. You don’t want losers getting out of hand and pulling you back from all your hard-earned successes and gains. Stop-loss orders can help make the decision easier. They’re actually a pretty good way of getting used to cutting off losers, particularly for beginners. 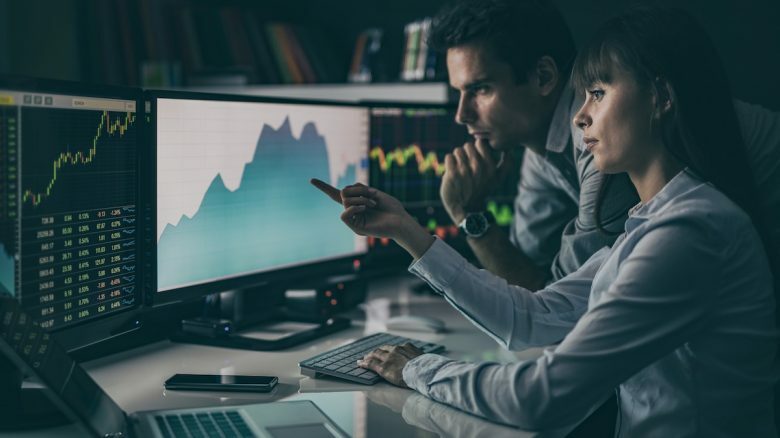 When you’ve identified the stock you’re interested in buying, you’re comfortable with what the overall market is doing and you’ve decided how much capital you’re going to risk, the next step that you want to take is figuring out your entry. You don’t want to be that guy that just pays across the spread and when the stock is at highs, he hits the ask and makes everybody else money but himself. Instead work with limit orders. This is especially important if you’re day trading and your margins are smaller. For the longer term traders it’s a good habit to get into as well. Ideally you want to try and time your entry just as a dip is turning and you’re getting as close to the low as possible. You should try it and become familiar as possible with certain stocks, particularly those that you’re interested in buying. You want to kind of learn the characteristics how these stocks act. 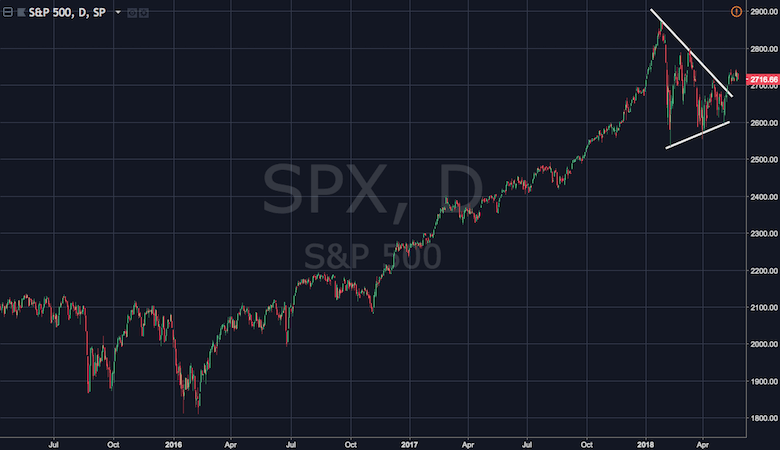 When you check the daily chart of the S&P all the way back through the second half of 2016 and through 2017, you can see this was a fairly smooth bull run. However, there have been lots of smaller pull backs that allow traders several opportunities to jump in and get long. These kind of pull backs in the S&P are characterized by multiple red days after the previous green days and the dip is typically bought after 1-3 days of selling. 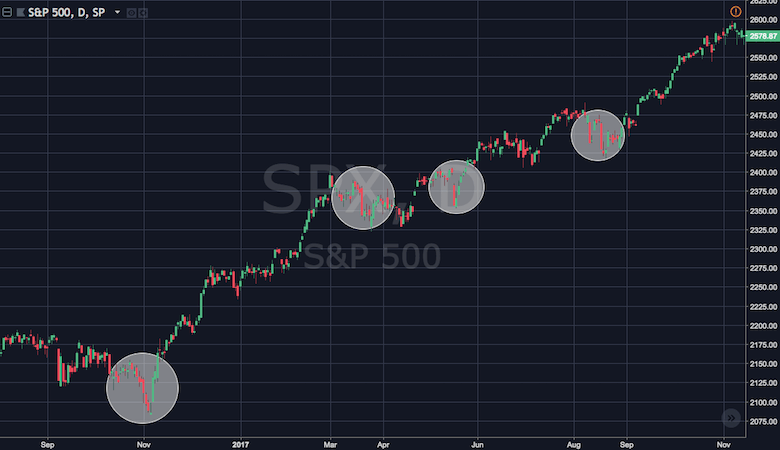 You could have a trading plan that says: “The next time the S&P sells off over 1%, you’re going to wait for a consecutively higher daily low and then jump in. You will puke if it sets new lows or if it goes below yesterday’s low. You will take 1/3 of your position off at the most recent high and then start working orders of the book”. This is how you can start coming up with a trading plan of how you’re going to manage the trade. You’re kind of covering all your bases, all eventualities and for beginners this is especially important. It can help you take some profit off the table quickly, you’re immediately reducing risk. However, it’s also just as important that you get used to working winners and actually putting the orders in for these winners. This can help stop you jumping out and panicking at the first sign of a red candle. It may be super handy to find some indicators that will help reinforce your overall thinking and feeling of how the trade is going to go. 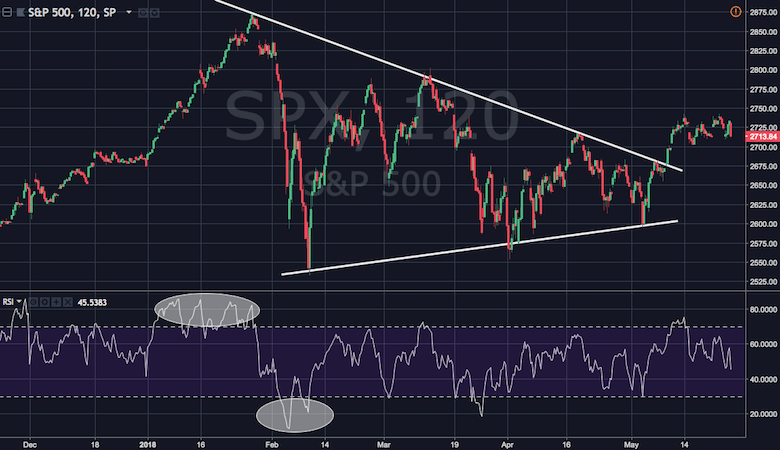 If you see the RSI over 70, you may not going to get long. Actually, you may be going to take some profit off the table. If you see a negative MACD crossover, you’re not going to get involved and actually going to exit your positions. This is how you start managing your risk. You start forming opinions, cementing your opinions and most importantly having a plan. Pull in your trend lines and know where the support and resistance is going to be. 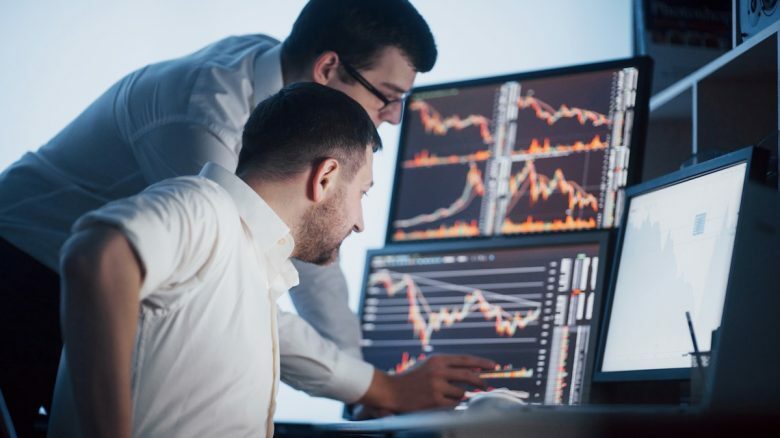 So far you’ve learned how to form an opinion, how to analyze the markets with technical analysis, how to manage your risk and how to figure out your entry point. However, just as important as picking the right entry point, is determining the exit strategy for your trade. There are many ways to successfully exit a trade. There is no right or wrong as the approach to exit a trade is based on your overall trading strategy. 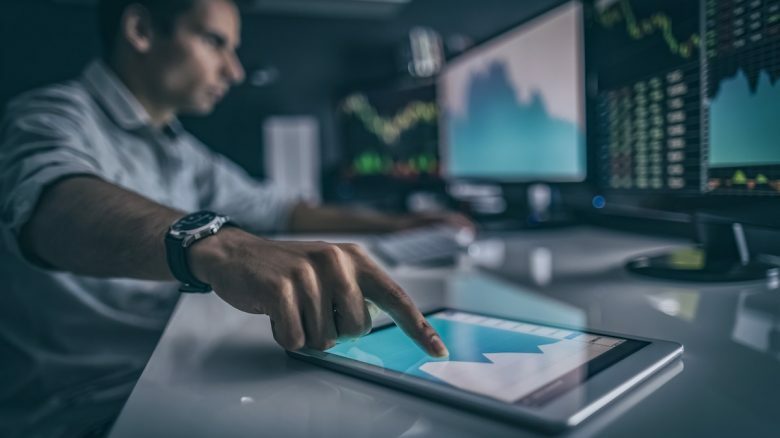 Some traders use trailing stops as exit strategy, others work with profit targets, pre-defined stop loss limits or other more advanced exit strategies. No matter what exit strategy you apply, make sure to always prepare your exit plan before you enter a trade and stick to it. As soon as you enter a trade, you should already know where your exits points are. Each professional trade usually has two exit points: a stop loss limit and the profit target. If your stop limit gets hit, it means you were wrong. If you reach your profit target, you were right and you can either exit the trade or partially take profit off the table, eliminate your risk and let the trade run if it still shows potential. An exit strategy is one of the most important aspects of a professional trading plan. You can manage to get an ideal entry point, but if you don’t exit the trade well, it usually will cost you money. Having a solid exit strategy with two pre-defined exit points will also give you the risk / reward ratio for your trade. If the risk / reward ratio isn’t at least 2:1, think twice if you really want to get into a trade. It may not be worth the risk. When those days come when you have to puke your losers, it’s all the more important to actually have a trading plan. Stick to it! You don’t want to get drawn into “this time it’s different”, “I’ll just hold a little longer” or “wait and see”. You’re only allowing your emotions to control the trade at that point. It’s not your rational thinking. This is when you’re going to be on tilt. You start losing control of a trade. The losers will get out of hand and they’re going to take away all your hard work up to that point. You should not go and set bad habits for the future. You don’t want to get used to holding losers, especially those past your puke point. Having these kind of rules helps professional traders managing any positions they are in or thinking about getting in. No matter what your personal market opinion is, always stay conscious of what the technicals are doing. This includes at least the very basic ones like the RSI (Relative Strength Index) and the MACD (Moving Average Convergence/Divergence). Use technical indicators together with your own intuition. Use what you’re seeing in terms of resistance and support lines to form your opinion. This allows you to keep an active hand on managing the trade and the way you’re thinking. The awareness of entry, exit and puke points is just as relevant for day trading as it is for swing trading and longer term trading. You just have to adjust your risk and your trading rules accordingly, but most importantly stick to them. Plan your trade and trade your plan. If you lose money in a trade while following your plan, then it’s the plan that needs to be tweaked. Implement that psychology early on. You got to build your discipline. Every trader is experiencing losers, but it’s only going to be you that determines how small and how controlled they are. You’ve now learned why a professional trading plan is important for long-term success as a trader. Whenever you get involved in the markets, make sure to stick to your rules in order to manage the risk. You’ve also learned important trader psychology tips on maintaining the right mentality from start to finish. These are the foundational trading skills that are going to stay with you for your entire trading career. What are your thoughts on creating a trading plan? How do you manage your trades, let winners run while cutting off losers? Please let us know in the comments below.